With the logo: "A WOMAN NEEDS A LOVE THAT WOULD DIE FOR HER! ", "ESTHER " is CFA Productions' 4th feature length film. Adapted from the Biblical account of the Book of Esther, our movie is a contemporary version of the Biblical saga. Set in the 21st century, "ESTHER" tells the story of a strong woman who overcomes formidable odds to avert the mass murder of a people; and, as a result, becomes involved in an interracial romance with a wealthy CEO. "ESTHER" stars some of CFA Productions' finest talent: Douglas Martin, as Alexander Hausman; Gerald Faught, as Haman Aguard; Christy Hamilton, as Zeresh Aguard; Robert Odell, Jr.; as Mordecai Hamlin, Carolyn Yancy, as Esther; as well as a host of other great CFA Productions' actors. 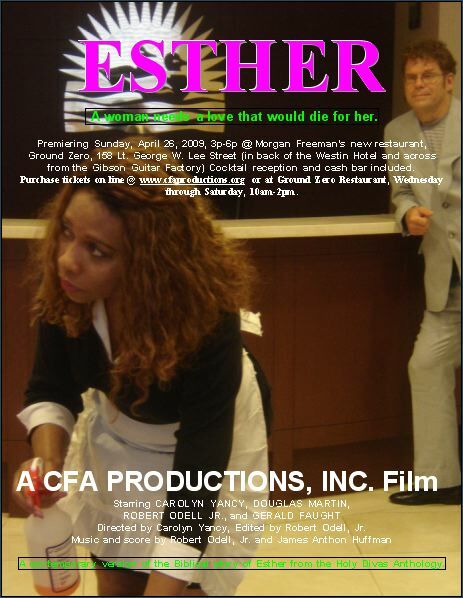 "ESTHER" is scheduled to premiere, Sunday; May 10, 2009; 3p-6p, at Morgan Freeman's new restaurant, Ground Zero, 158 Lt. George W. Lee Street; Memphis, TN 38103. Purchase your tickets today for the premiere of "ESTHER", by clicking on the "Buy Now" below! To view a Trailer of "ESTHER", click here! Copyright © 2009, Carolyn's Finishing Academy/CFA Productions, Inc.. All rights reserved.